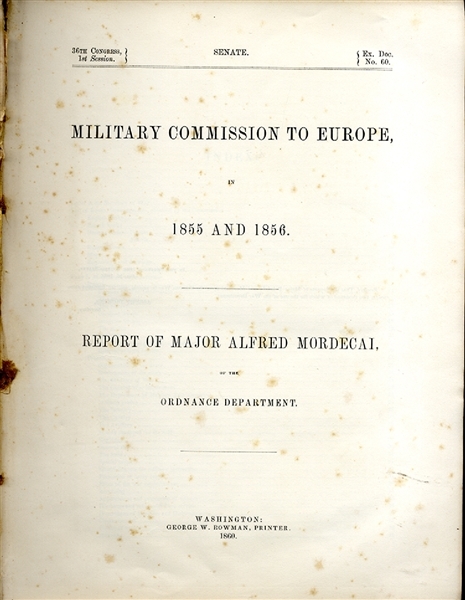 Book “Military Commission to Europe, in 1855 and 1856. “Report of Major Alfred Mordecai, of the Ordnance Department.” 1860 Washington, Senate imprint, 232pp. with pull-outs. Covers a wide range of subjects from organization to recruiting for various European armies. Embossed cloth binding. 21 Plates + 13 Folding plates of small arms & cannon in rear. Line Drawings of ordnance. This report is the result of two years of travel and study of European artillery and small arms development. Sponsored by the Ordnance Division of the War Department, it exerted a great influence on American weapon design and construction during the Civil War. Appended is "Rifled Infantry Arms: Very good condition.